Did tried the beef casserole but the taste is a awkward and is not like a purée is more like a soup . Haven’t seen much beef in it or even haven’t find and beef taste at all. Easy meal for on the go mums. Price makes it more likeable! Healthy meal, and my son loved them. I keep pouches in my baby bag Incase we’re out and about during meal times, this happened to me yesterday at the doctors, so I whipped open the pouch and fed harry. They’re so convenient and can be eaten cold too. I personally tried it and didn’t like it but harry wolfed it down! I need to buy some more! I use these pouches when I'm out and about with my son and he always eats them cold or warmed. I bought this for a quick tea for my son who normally has his dinners cooked from scratch and with more texture and I found this really disappointing. It had like a soup consistency, there weren’t many lumps or pieces of meat and my little boy likes to chew and feed himself. With this I had to feed him and it wasn’t a great experience for him and he left half. Very useful when out and about as all need to do it open pop in a bowel and microwave. My baby has multiple allergies is to find a baby food in this store that was suitable for him was amazing. No milk or soya and totally worth the price - it’s 50% less than other well known brands. I’ve tasted it too and it’s lovely. This product is great price and safe for my baby. I really enjoyed feeding these products to my first child and I will continue to do so with my next one. My daughter absolutely loved these pouches, cheap and easy to make too! Great if time isn't on your side. Love aldi own brand for many things. My son loved this flavour and had tried and loved the other flavours too. However, the food seems to be quite oily and very easily slides off the spoon. Grease marks left on clothing too. My baby is fussy this is the only brand she will eat. Nicely priced easy to swallow for weaning babies and a nice variety of flavours. Really easy to empty into a bowl to warm up. Good baby food full of flavour ! Easy to use and a good price too. My little boy loves these pouches! Would definitely recommend them ! This is great for when you are out and about with your baby. I used these whenever we went on day trips. My little girl really enjoyed them when she was just weaning. 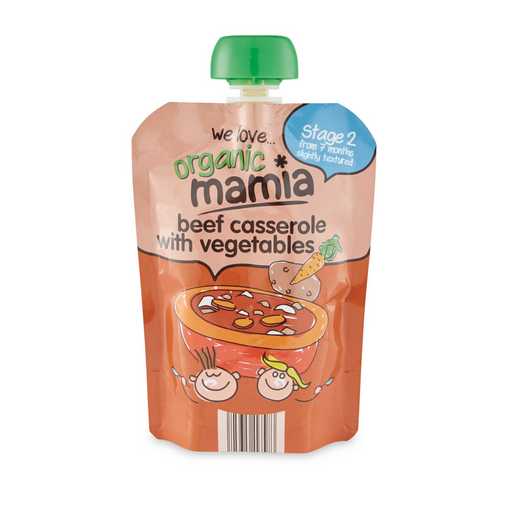 Absolutely brilliant and my baby loves mamia foods. She has tried all the different types and we have been pleased with all of them. 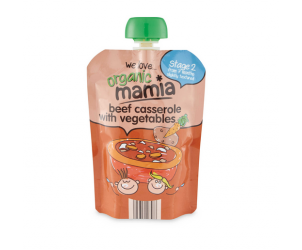 Mamia's Organic Beef Casserole with Vegetables.